Along with the P90X Training System, you’ll get a Chin-Up Bar, new Chin-Up Max, Tony Horton’s PowerStands, 3 additional P90X ONE on ONE Advanced Workouts, a month’s supply of Beachbody Performance Recover, along with three heavy duty resistance bands. Order now and get 2 bonus P90X workout DVDs – Fountain of Youth Yoga Workout and Mammoth Upper Middle Lower Workout, a $40.00 retail value. Beachbody has provided Intense Fitness with a limited supply of these bonus P90X workout DVDs. We are giving them away with each order of the P90X Ultimate workout. Are You Ready To To It On, Full-Speed? Along with your P90X Training System, you’ll get a Chin-Up Bar to help build that ripped upper body, and our new Chin-Up Max, a breakthrough tool used with your Chin-Up Bar to help offset your body weight so you can work your way up to doing more reps. Plus, you’ll also get Tony Horton’s PowerStands to help lessen the strain on your wrists and achieve the perfect push-up, as well as 3 additional P90X ONE on ONE Advanced Workouts like getting a personal training session with Tony. Also included is a month’s supply of Beachbody Performance Recover to help combat exercise induced muscle soreness, speed muscle recovery, support muscle growth, and restore your strength. Along with three heavy duty resistance bands to maximize your results. Select Heavy Bands to receive Black, Green, and Red (3050 lbs.) or Medium Bands to receive Pink, Magenta, and Orange (1525 lbs.). The first DVD focuses on strength and definition exercises for your upper body, specifically the back and chest. The second DVD features a plyometrics “plyos” cardio routine to improve athletic performance through fast, powerful movements. DVD three uses a combination of presses, curls and fly movements to target your shoulders and arms for strength training. The forth DVD uses a combination of balance, flexibility and strength to both tone your physique, while using breath work to calm your mind. DVD 5 is all about power moves, targeting the legs and back. Using movements like squats, lunges and pulls for strength training. DVD 7 is essential for creating that “long, lean look” through various stretches and muscle elongation, which also help to prevent injury as well. DVD 8 uses movements that work several muscle groups at the same time, while building muscle and conditioning. The ninth DVD is all about building upper body muscle, targeting both large and small muscles. The P90X program is known for leaving bodies ripped and DVD 10 focuses on building and toning the biceps and back. Cardio X, featured on DVD 11, is a low impact cardiovascular routine targeting burning fat and building lean muscle mass. As the title suggests DVD 12 is all about abs. These routines are designed specifically to build your core and build the abdominal muscles leading to the much sought after six-pack abs. Develop and strengthen your shoulders, back, and arms with this high grade training tool featuring 10 pro grade handles with multiple grip positions. The Chin Up Max is a chin up assistant tool that helps you by assisting in the chin up motion by proving support. Maximize every minute you spend on the chin up bar. This tool gives you the right amount of adjustable support to help you strengthen and train muscles as you work toward unassisted moves. Designed and used by celebrity fitness trainer Tony Horton, these premium heavy-duty stands help strengthen and sculpt while lessening the strain on your wrists or forearms. Recover takes advantage of the critical post-workout window with the ideal combination of time-released proteins and phytonutrients to help facilitate muscle recovery while helping to reduce muscle breakdown. Resistance bands are an aid that require more effort while working out and therefore, offer more calorie burning to the P90X workout! Just as effective as free weights, resistance bands are much more portable and convenient, so you can work out anytime, anywhere. Select Heavy Bands to receive Black, Green, and Red (3050 lbs.) or Medium Bands to receive Pink, Magenta, and Orange (1525 lbs.). The fitness guide is a great resource to have included in the P90X program and a one stop shop for questions, as it outlines the entire program and shows exactly how to use proper form with each exercise. The guide also gives insight on how to tailor the P90x program for each individual. 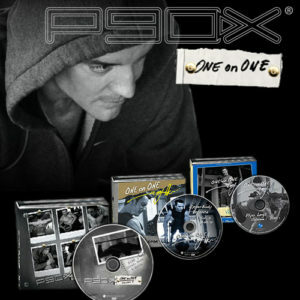 The How To Bring It DVD is an overview of the complete P90X system. How To Bring It, takes you through nutrition, supplementation, vitamins and safety, helping you to achieve maximum results with the complete P90X program. The P90X calendar is a great tool for tracking workouts weekly and monthly, as well as, monitoring your results. Designed to help users stay motivated, ask questions, get answers and get new ideas from the P90X community. It’s around the clock access to fitness experts and peer support. P90X had sold over 3 million copies! With so many people using P90X, including celebrities like Demi Moore and Mike Tyson, what’s the secret to P90X’s success? The answer is muscle confusion! P90X uses focused training phases so your muscles keep adapting and growing. Unlike most workout routines that use repetition and the same motions day in and day out, P90X keeps switching things up so your body never has the chance to plateau as you would with a normal routine. What this means is, while working a certain muscle group, most people tend to use just a few different exercises. Eventually, your body and muscles adapt to the routine and begin to “Plateau” or slow down. To prevent this from happening, each muscle group needs to be worked out using a variety of exercises that are changed up frequently. This is to prevent your muscles from getting “bored” so they will continue to adapt and grow. So, in this sense, Tony Horton uses the phrase “muscle confusion”, where you’re not just repeating the same routines day after day� your mixing things up to confuse the muscles to avoid the dreaded plateau.